The most anticipated season of the year arrived in San Benedetto del Tronto in May: the sun was already shining, the beach was welcoming the first tourists and the temperature was 27 degrees Celsius, almost always. However, the first real day of Summer should be the 21st of June: the solstice marks the beginning of the warm season, of the (Summer) break and the beach days. As well as sunny days, the 21st of June brings the sales season: indeed, throughout Italy discounts start at the beginning of July. In Marche region, in our case, they will start on July the 7th and will end on the first days of September. Make targeted purchases – we all know the ease of falling into current trends’ madness, especially during sales season… but before going any further, stop and think about it: do you really need that t-shirt, that is really trending right now, but that doesn’t match your wardrobe and your style? Don’t’ fall into shopping madness – a t-shirt today, a bikini tomorrow, a pair of earrings the day after… Can small purchases really hurt that much in the end? Yes, they can. Don’t give in to the temptation! A small purchase today, one tomorrow and at the end of the month the wallet will be empty! Follow these two simple rules and you’ll finish the season with some new and useful pieces for your wardrobe and, most of all, with a not so empty wallet! Has it ever happened to you to find the perfect product, the one you’ve been looking for a really long time and find out that is defective, yet discounted? I’m sure we all had the same doubt: should I buy it because it’s really a good chance to get what I want by paying it less or should I forget it because it’s not perfect? If I buy it, will I use it? Or will I pay attention to the defect? Well, we had to make up our mind more than one time: we found the perfect way to make a decision. Here our method explained in 3 cases using our bags. Sometimes a craftsman can make a mistake while manufacturing the bag: it doesn’t happen frequently, but when it happens we have to sell the product nonetheless. A spot or a scratch doesn’t deprive the product of its soul: Italian craftsmanship and handmade production. For example, let’s consider our SKU16867. 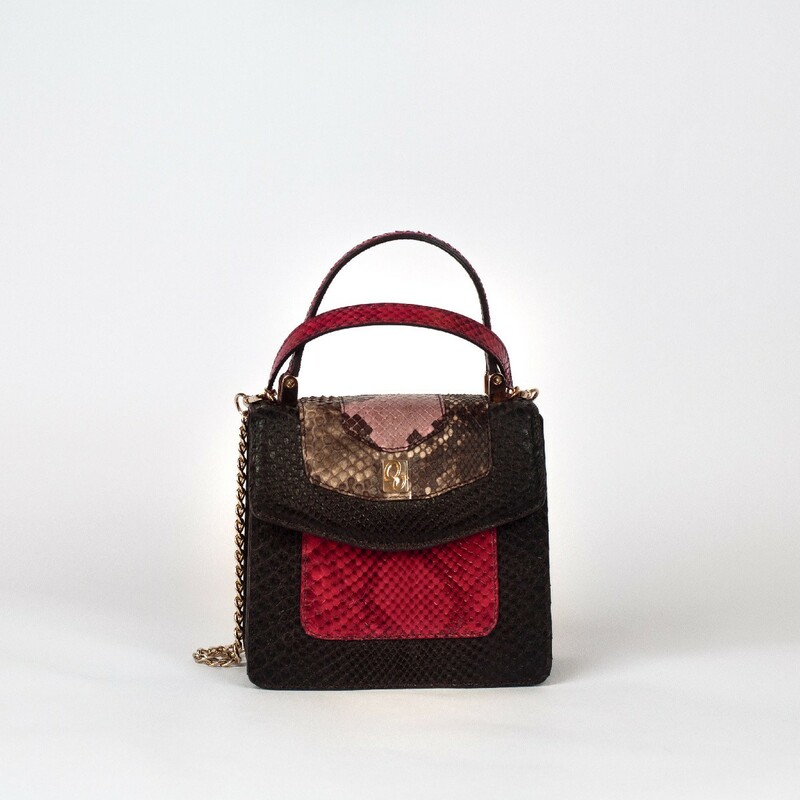 This beautiful rounded handbag was made of genuine Molurus python leather. We used a front cut, so it has an amazing design! The foundation of the leather is white, grey and silver with a peculiar pearly effect. To emphasise the candid look, we also added white Nappa leather details! Due to its white foundation, everything that is not shiny white stands out as “yellowish”. Even when it’s not. 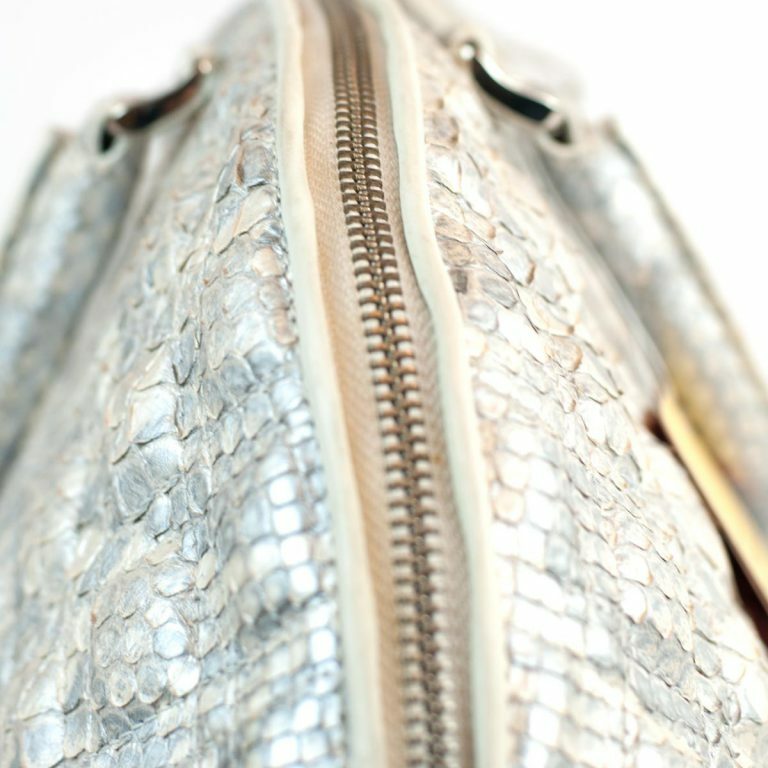 So, the problem is that the zipper of this bag is not shiny white and that it has some small spots near the closure. These two flaws are probably the result of warm weather. You can see an example photo below, or on product page. However, both these imperfections don’t compromise neither the overall look of the product nor it’s performance. This soft and rounded handbag keeps its charme and GLENI’s bags quality and performance. It’s a steal considering that all our models are made in one piece! Each bag we manufacture, as you may already know, is a unique piece. We really care about the uniqueness of our products, and sometimes we take its toll. Sometimes, we showcase our bags at events and fairs. These same bags come back to our boutique where they can be seen and touched by our customers. Of course, team GLENI does its best to keep the products safe and far from any harm, but a misadventure is always around the corner. That’s the case of the next bag: QUEEN, must have and bestseller. 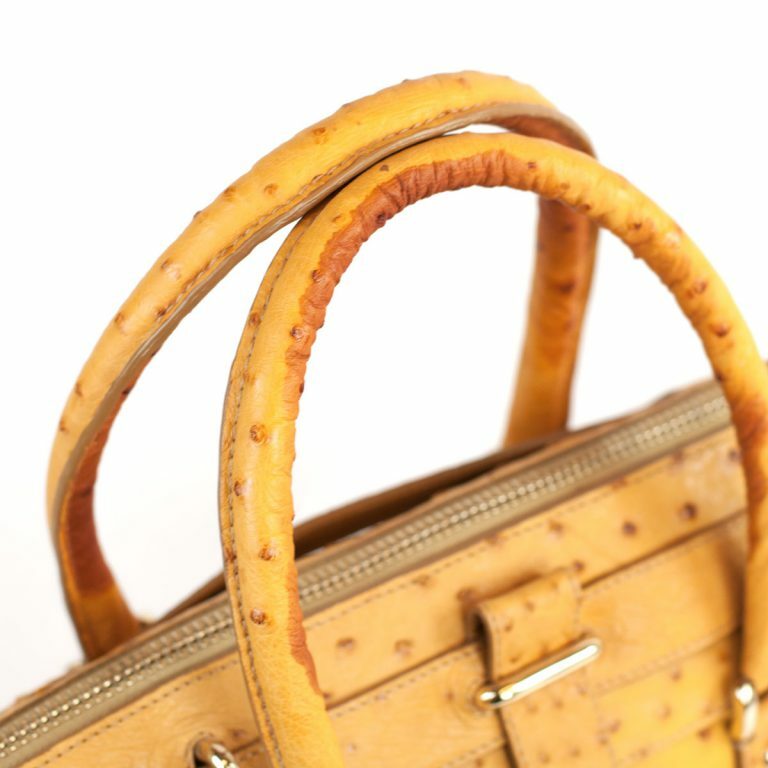 This one in particular was made of genuine ostrich leather in a warm buttercup color. This model is really loved by the visitors of our San Benedetto del Tronto’s boutique: here “look but don’t touch” is not a thing. We regularly write on our blog that exotic leather is soft and resilient; our customers, sometimes, are afraid to touch such a precious product, but we encourage them to try and see themselves the qualities of exotic leather. However, this bag had a misadventure along the way: both handles had been hopelessly stained. The rest of the bag maintained its original splendour but the stains on the handles, unfortunately, condemned it to discounts. 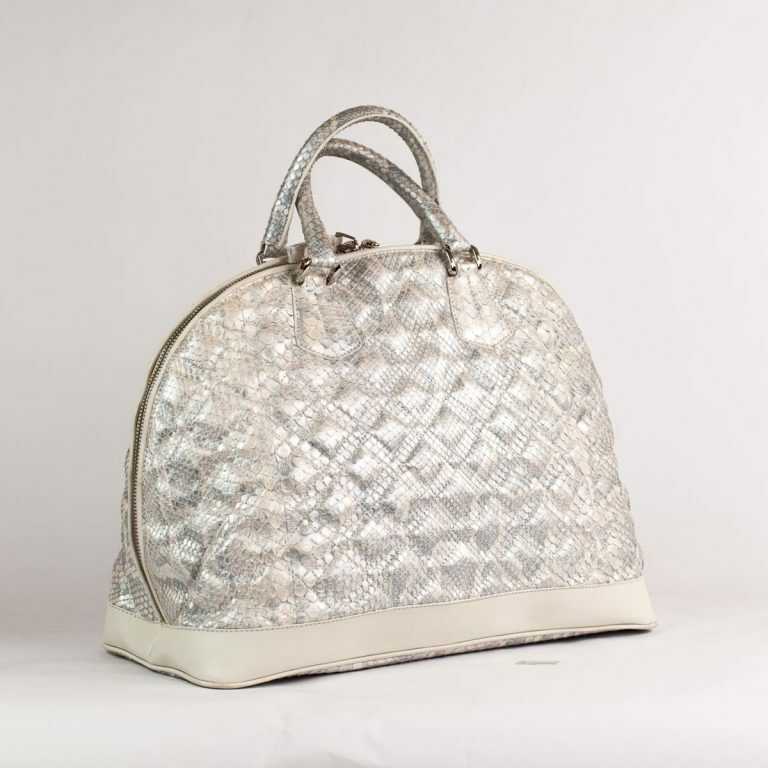 Its original price was € 1798.00 and now the bag is being sold with a 50% discount: currently its price is of € 899.00 (VAT Excl.). It’s a deal for a bag made of genuine ostrich leather! You’ll say, “and what about the handles?” The bag is made of a beautiful and warm tonality of yellow, so it’s perfect for summer. And you know what else is perfect for summer? Kerchiefs! You can solve this flaw by wrapping a colourful scarf around the handles. Make it blue if you like bold, summery combinations. And if you want to use this bag in winter, change the blue kerchief and use a sober one, something earthy toned and… you’ll be good to go! Fashion world is evolving: unlike 10 years ago, some peculiar characteristics (that were once seen as “ugly”) are the badge of honour of beauty models and of fashion brands that they represent. In the same way, an imperfect bag can be your claim to fame: each stitching and each crease, are the evidence of the craftsmanship of an artisan. For example, one of our bestseller, belonging to ICONIC collection is VERA. This mini bag was recently reintroduced in our boutique, after a long work of improvement. One of the first new VERA made for our boutique, was this one in genuine crocodile leather. Later, we choose it improve it even more, manufacturing new pieces and raising the standard. So, the crocodile one had to face the discount: 25% less on standard price. Would you consider it a defect? Or a badge of honor? 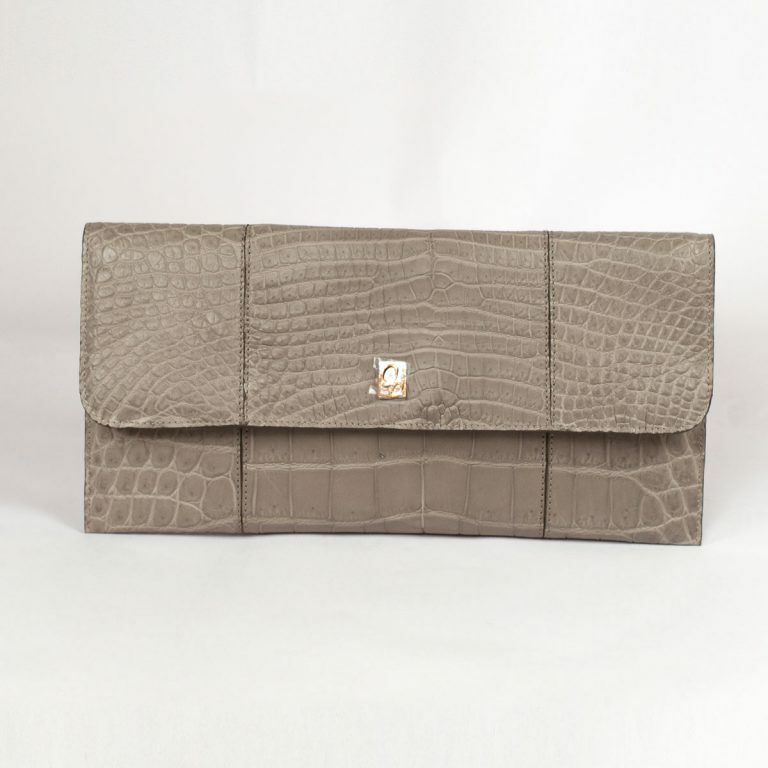 By buying this bag, you’ll, in fact, have a bag that was handcrafted, made of genuine crocodile of 100% Italian origin and production and with unique stitching. A real unique piece! 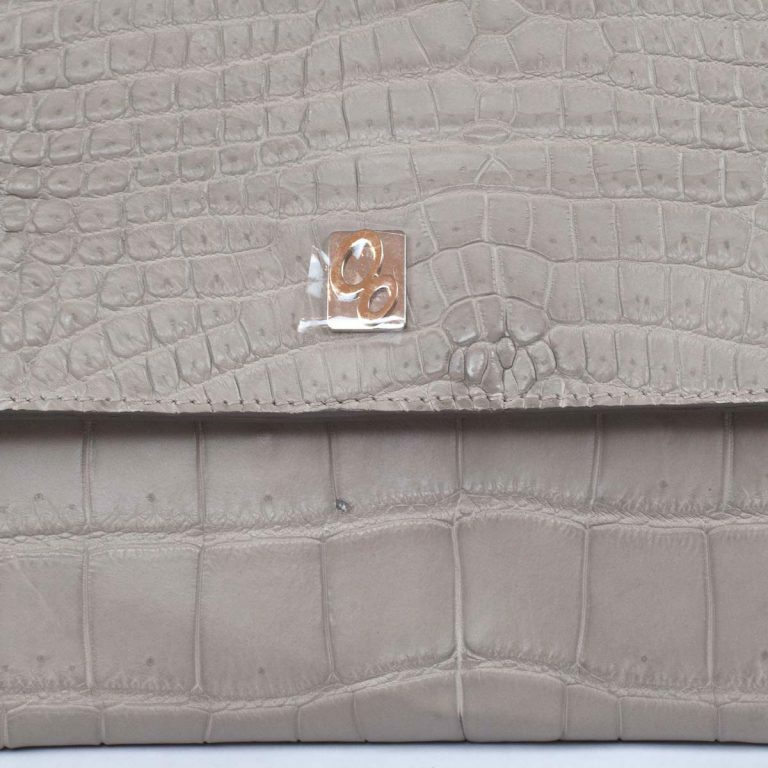 Last, but not least: the crocodile used, a piece of leather near the tail, was willingly put off centre, to enhance even more the beautiful exotic texture. And the color? A beautiful, sober and elegant clay grey. A new generation of neutrals. We’ve been manufacturing handbags and accessories for many years (almost 18). We have met many different artisans with whom we have collaborated, discussed heatedly, found a solution and discussed again … and what we have managed to understand is that there are more precise and less precise people. The craftsmanship, however, remains worthy of esteem even if there is a spot here or there. Of course, we prefer to work with very accurate people, but we cannot and do not want to devalue the Made in Italy tradition just because a zipper has become yellow. When you buy a purse with an imperfection, you still choose a bag that is handmade by a person who has put all his knowledge, his commitment and his time; you choose a bag made of certified high-quality leather, manufactured by the best tanneries in Italy; you choose a unique and special bag that will be yours alone. So, what are you waiting for? Get ready for discounts: they start July 7th! This entry was posted in Presentation products, Shopping Online on 06/22/2018 by Serena.